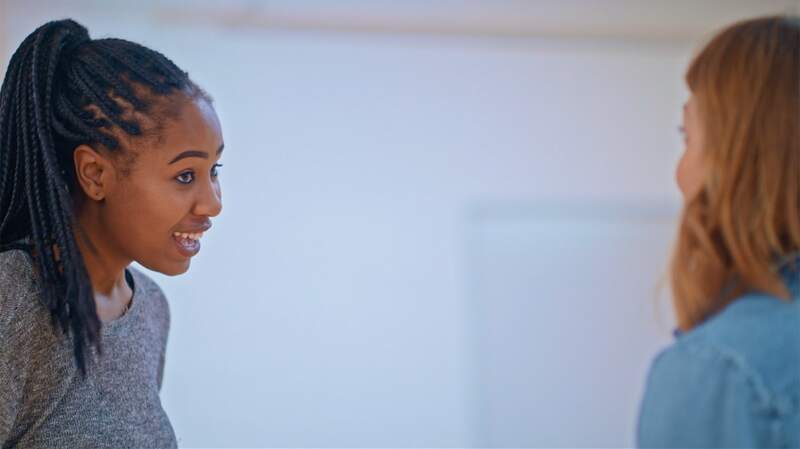 Olyvia Mugweh ’17 on dance at Rowland Hall: "Sofia helped me find myself as a dancer, and in that, I was able to find myself as a person." Dance concerts often showcase contemporary movement, but as part of the curriculum, students also learn traditional styles. 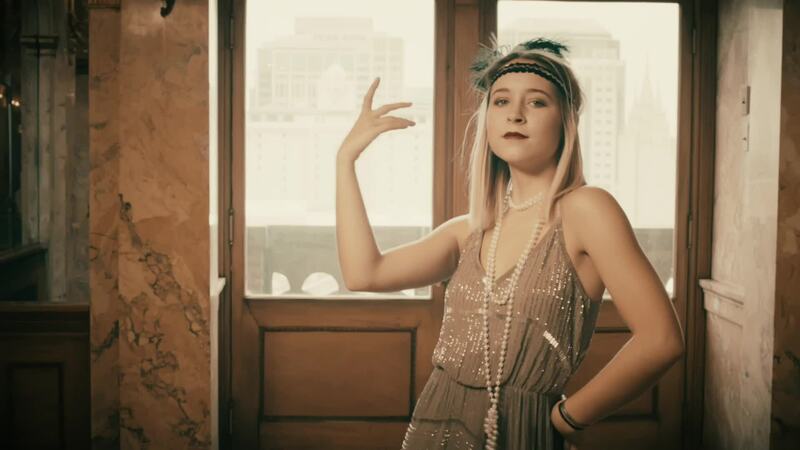 Here, upper schoolers channeled that knowledge to choreograph and perform this fun, kitschy, roaring-twenties tribute—a crowd-pleasing video intro for Rowland Hall's 2017 auction, the Great Gala. Whether taking a dance class or becoming fully immersed in the choreographic, rehearsal, performance, and social aspects of our Ensemble program, aspiring and accomplished dancers find our program inspirational and deeply involving. Professional dancers Sofia Gorder and Allison Spehar direct and choreograph middle and upper schoolers across the full gamut of styles—from modern dance to musical theater, and from jazz improvisation to contemporary ballet. Every year, two dance concerts—one in fall, one in winter—energize our school community. Rowland Hall offers a yearlong Lower School Dance Ensemble for second through fifth graders in our Extended Day Arts and Ensembles program. Once they're in middle and upper school, dancers are placed in Ensembles 1–6, but they're encouraged to reach across course levels and age groups to learn from one another. Dancers, after all, often work collaboratively to build something larger than themselves. Middle schoolers work toward efficiency in movement through classical training methods such as ballet, jazz, and modern dance, as well as parkour, break dance, hip hop, martial arts, improvisation, and composition. The goal is to develop the following: the body as a tool for physicality; individual voice; technical skill for dance as an art form; and the ability to work collaboratively, negotiate the creative process, and perform. As our students develop as dancers, so does the depth of the curriculum. In the Upper School, emphasis is placed on both proficiency and fluidity in a variety of traditional and contemporary styles. Every spring, senior dancers present a concert as the culmination of their Rowland Hall dance careers. Arts Department Chair and Director of Dance Sofia Gorder readily admits that history classes didn't appeal to her much in high school. "It was mostly a white-centric narrative about wars," she recalled. It wasn't until she got to graduate school and started studying the history of movement that she developed a powerful connection to past generations. "In the history of movement," Ms. Gorder said, "when people didn't have a voice, they'd use their bodies. All these marginalized voices emerged through movement that was then commodified and adopted by mainstream society." When planning her annual dance concert this year—Rowland Hall's sesquicentennial—it made perfect sense to use the history of movement as an opportunity for students to explore the silenced voices of the past 150 years. "Asking kids to dive into those marginalized stories and then connect them to the stories we're taught in normative history has been really fruitful," Ms. Gorder said. "They're learning that disco and the twist evolved from slave dances, and that Jazzercise stemmed from the empowerment women felt after watching gay men dancing in clubs during the AIDS epidemic." (R)evolution, as the concert is titled, ran Thursday through Saturday—February 8, 9, and 10—at the Larimer Center for the Performing Arts, and delivered both a celebratory retrospective of dance in America and a rumination on how history learned through words and images doesn't tell the whole story. Senior Sophia Cutrubus described the show as tracing the evolution of mainstream dance while demonstrating how the art provided "an outlet to express ideas and emotions that were taboo and threatened power structures in each time period." Approximately 120 students in sixth through twelfth grades performed renditions of period pieces ranging from the minuet to hip hop, with mixed-media transitions giving contextual cues, and narratives to aid the timeline. Many of the students learned archived dances rather than developing original choreography, which made the process for this concert more educational than creative, according to Ms. Gorder. However, the research and practice of embodying highly respected artists from other generations can inform students' artistic voices in the future. Among the handful of students staging original work was junior Katie Rose Kimball, who teamed up with senior Sydney Rabbit to choreograph a piece about the history of body contact in partner dance. Sophia also had an original piece in the show: she and senior Rowen Kenny created a sequence of five dances based on the work of Merce Cunningham, and audience members will unwittingly have a hand in how these dances are performed each night. Junior Tori Kusukawa oversaw a cluster of dances that will pay homage to major stars from the 1990s, such as Whitney Houston and Prince. While he copied choreography for Michael Jackson's "Smooth Criminal" from music videos and live performances, he had to improvise when it came to mimicking David Bowie. "He didn't really dance much," Tori said. "So I had to capture his attitude and feeling." He relied on Ms. Gorder for guidance, as all the dancers do. "She lets us try and fail," Sophia said. "But she's always there at the end to make sure it goes well on stage." Whether students are perfecting a replica of historical dances or producing original content, their engagement with the past helps them draw connections to the present. Sophomore Grant Dacklin choreographed a piece to showcase a style of movement from the 1970s called locking, which he referred to as hip hop's disco. While he's excited about the sharp, detailed nature of his own piece, he also recognized that this show has required him to embody roles that he's not familiar—or comfortable—with: as a straight, white male, he depicts the role of the oppressor in history. However, Grant believes that Rowland Hall students are in a prime position to communicate about discrimination and the need for greater awareness, especially since so many revolutionary movements of the past were youth driven. "I hope that the teenage perspective has power for people," he said. "Even though these dance pieces are founded in history, we are bringing our modern-day voices and identities to them." While Ms. Gorder and the dancers hoped the audience would enjoy the high-energy, community-oriented theme of the concert, they did not shying away from the show's messages about cultural appropriation and the historical biases that viewed bodily movement as low class. Katie Rose emphasized the influence dance has on society, and Sophia agreed, adding "dance is an integral piece of culture shifts." The art form also provides a unique historical lens, Sophia reflected: "Because your body is your medium in dance, there is nothing to hide behind. People can't escape their identities while dancing. You're seeing the most pure expression of who they are—their stories, their struggles."